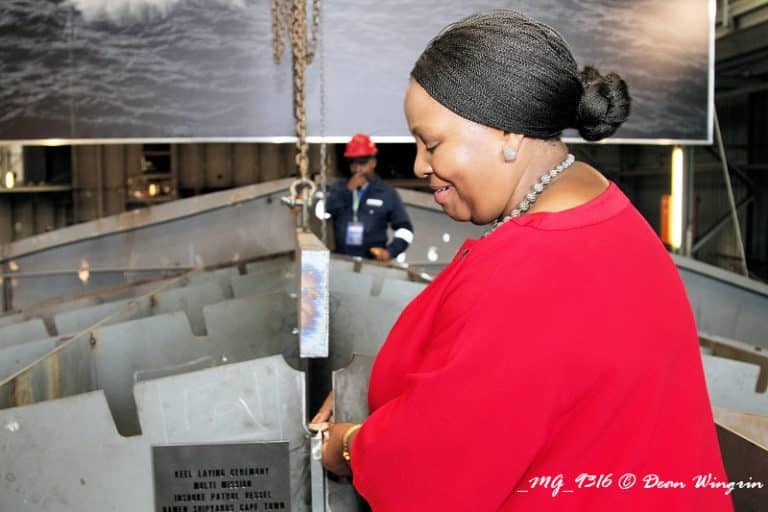 Nosiviwe Mapisa-Nqakula at the IPV keel laying on 23 February. Damen Shipyards Cape Town (DSCT) has ceremonially laid the keel for the South African Navy’s first of class Multi Mission Inshore Patrol Vessel (MMIPV) at its shipyard in the Port of Cape Town on 23 February. As explained by Chief of the South African Navy Vice-Admiral Mosiwa Hlongwane, a keel laying ceremony is an important tradition for any shipyard. It is naval tradition that every ship constructed for service be honoured on four historical ceremonial occasions, being: the keel laying; the christening (or launching); the commissioning; and decommissioning. Although most ships are constructed using a modular system that does not include a traditional keel, the keel laying ceremony is still an important part of the construction process. Traditionally, the ceremony is meant to invite good luck during the construction of the ship and continued good fortune throughout the life of the vessel, whereby a commemorative coin is placed into the area of the keel and welded into place. The event in a modern sense celebrates the first milestone of a ship’s construction. The acquisition of the MMIPV under the R1.5 billion Project Biro was approved in October 2017. The new vessel, P1571, will be completed in 2021 and is expected to be commissioned in June the same year. The second and third platforms are expected to be delivered in 2022 and 2023 respectively. But it is clear that the Navy would like the vessels delivered earlier. Speaking at the ceremony, Defence Minister Nosiviwe Mapisa-Nqakula explained that the new MMIPVs will cater for the roles and obsolescence of Navy vessels such as the Strike Craft, Mine Countermeasures Vessels and the Torpedo Recovery Vessel that have been in service for more than 40 years. “Having completed the Navy part of the strategic defence packages (in the early 2000s), the need for the Multi-Mission Inshore Patrol Capability for the South African Navy vessel capability was identified and thus Project Biro was born and duly registered,” she said. Hlongwane explained that the new vessels would be well suited for the purpose and will enable the South African Navy to mount “cost effective, focused and more efficient missions and operations” as the new vessels would be well suited to this task. This would allow the frigates to re-enter their planned maintenance cycles, without losing the navy’s crucial presence at sea. In particular, it is the primary war-fighting capabilities that have been severely affected. Project Biro’s expanded capacity would then enable South Africa to mount cheaper, more focused and more effective missions and operations against the above-mentioned threats and challenges it encounters in its maritime domain, especially illegal fishing and trafficking. Other tasks include search and rescue, hydrography, disaster response and assistance, peace support operations and naval diplomacy. The Minister of Defence, the SA Navy and Damen Shipyards highlighted the importance of the vessels being built in South Africa, in line with the national priorities detailed in the government’s maritime development plan known as Operation Phakisa. DSCT is furthermore targeting to over perform on the 60% local content obligation. The Multi Mission Inshore Patrol Vessels will be built according to the patented Damen Axe Bow design, which Damen says ensures low resistance, high sustained speed in waves and superior sea keeping characteristics, even in the toughest conditions. As vertical accelerations are reduced significantly and bow slamming is even entirely eliminated, the safety of the vessel and crew increases significantly, reducing operational risks. The MMIPVs will have an overall length of 62.2m, beam of 11.0m and a maximum speed of 20 knots. They will be crewed by 40 personnel, with space for an embarked force of 22. They will also be fitted with a Communication Intercept System and a passive Close-In Surveillance System. At the launch, DSCT Director Sam Montsi, said: “The event today signifies the start of the building of Project Biro. Over the years, our shipyard has undertaken many projects for local and international clients but none as significant as Project Biro. This project is being built and delivered within the agreed specifications, timelines, and budgets. “In addition, at our yard more than one million man-hours of work will be created during the construction of Project Biro. Within this will be the sustainment and/or creation of over 1,000 direct and indirect jobs. “We are also supporting and facilitating opportunities for local businesses and have selected equipment and service suppliers that have 51% black ownership or are owned by black military veterans. We will be working with these Small Medium and Micro Enterprises to improve their performance which will lead to improvements in their product or service offering, business processes, lead times and delivery. This will ensure that non-traditional suppliers cease to operate on the peripheries of the formal economy and increasingly become more sustainable.